It’s exciting when any service manager gets the go-ahead to purchase a solution from as big and well known a brand as HP, because it is a heftier investment when you’re playing with the big boys. So imagine how dashed you might feel after that win when you realize that the dollar amount you got approved for only buys you the tip of the iceberg. This is the unfortunate case when it comes to HP Service Manager. Although there are some good features that come with HP Service Manager itself, a lot of the essential functionality service managers actually need — especially if they’re looking to improve their businesses significantly by leveraging BI — isn’t included. Take, for example, one of the most foundational elements of ITSM software: the dashboard. That has to come standard with every help desk solution out there, right? Wrong — at least in the case of HP Service Manager. The HP IT Executive Dashboard, which provides this capability, is actually an add-on — and an expensive one, at that, not only because it costs a bunch in and of itself, but because it requires significant and expensive technical expertise to use it. What about Web-based report sharing? Everyone uses the Web nowadays to pass information along. Unfortunately, though, in the case of HP Service Manager, the reports included with the software aren’t Web-based. That means they have to be copied to each employee’s desktop and, obviously, can’t be shared (at least not that way) with partners and clients. In order to enable the Web-based report sharing most want and need, additional licenses for Crystal Reports Web Server must be purchased – another exorbitant fee. At least those out-of-the-box reports are included, though. That’s a good thing, right? Well, yes … if you have someone with the expertise to utilize and modify them. Given that HP Service Manager’s reporting capability is based in Crystal Reports, a very complicated program, it’s difficult to create reports in. In fact, an IT developer with a SQL background is required to do anything meaningful with this software. And what if you wanted customized reports? Even if you had a SQL-savvy person on staff who could create them, you’d still have to pay extra in software licensing for that particular capability. You know you want to improve your service management operation by leveraging your BI, but you also know you’re not going to be able to get buy-in for additional pricy solutions. What can you do? We built Yurbi for HP Service Manager specifically with this dilemma in mind. We know what you’re up against as a service manager, and we took our familiarity with the strengths and weaknesses of HP Service Manager and created a solution that addresses all its shortcomings — and more! 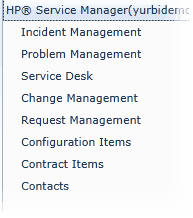 Yurbi for HP Service Manager includes multiple dashboards to choose from, all of which map out any of the components of the HP Service Manager database (including Incident, Problem, Service Desk, Change, Request, Configuration Items, Contract Items, Contacts, etc.) you want. Better yet, Yurbi can integrate data from other systems as well to give you a complete view of your business and empower you to make the most educated BI decisions possible. Yurbi has also made report creation, modification and customization a breeze. Its intuitive structure enables everyone — from the least to most tech-savvy on your team — to build reports and utilize data to make a difference in your organization. And since Yurbi has Web-based reporting, you can share that transformative data internally and externally with equal ease. Don’t spend another fortune when an affordable – and user-friendly – solution is already out there – especially when it’s one that can have you up, integrated and running in under 45 minutes. Try Yurbi live today or contact our Customer Success team for more information.